Since 2003, residential and commercial clients have trusted Freedom Fence for the highest quality arbors, pergolas, trellises, and gates in Sussex County NJ and nearby communities. Vertical garden elements, such as trellises, arbors, pergolas, and ornamental gates, add dimension to your landscape, define spaces, and enhance the beauty of outdoor living spaces. At Freedom Fence, we offer a broad range of outdoor structures custom designed to your specifications. For your convenience, our design team is available to assist you in choosing the best materials and styles for your landscape. For a free consultation and estimate for trellises, arbors, pergolas, gates, or our other fencing services in Morris County NJ, contact our team at Freedom Fence today! 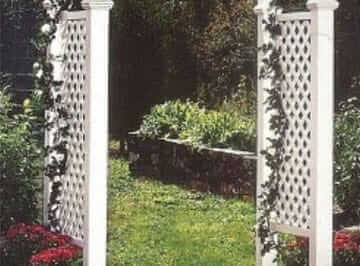 Do you need more information about our trellises, arbors, pergolas, or gates in Bergen County NJ? Call (973) 694‐7707 to speak to a member of our team at Freedom Fence today!